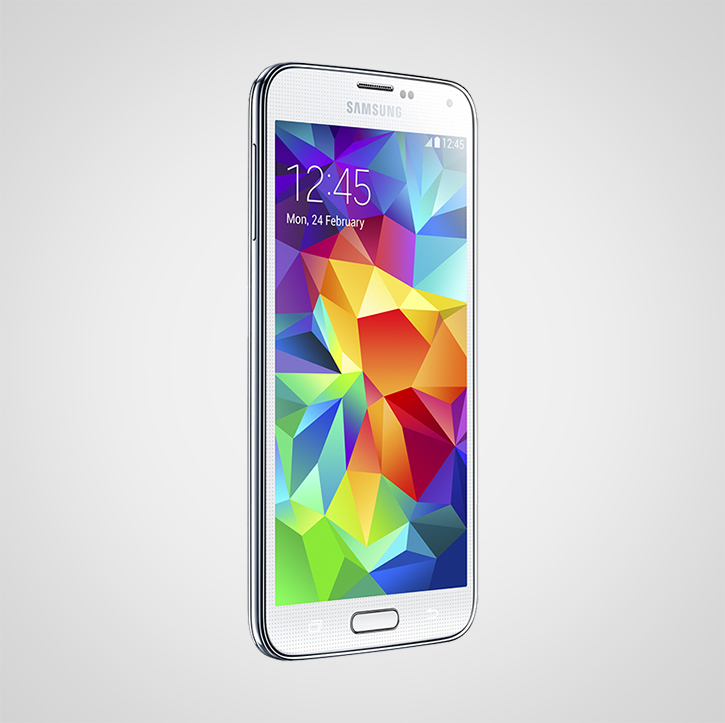 Say goodbye to slippery shiny plastic, and hello to the new Galaxy S5. Samsung has officially introduced its latest flagship handset today at the Mobile World Congress event with a larger 5.1-inch FHD Super AMOLED display with full 1080p HD resolution. Samsung's new Galaxy S5 features a number of hardware and exterior design improvements starting with its rear shell, which is now a dimpled textured polycarbonate with a matte soft-touch finish for added grip that Samsung is calling a "glam look". The front of the S5 is otherwise indisputable from its predecessor except for that vibrant new wallpaper art, keeping that familiar Galaxy styling. But there's more, the Galaxy S5 is IP67 rated which means that it is water and dust-resistant and can be submerged underwater up to 1 meter deep for up to 30 minutes. Underneath what we'd assume is a remorseless plastic construction, the Galaxy S5 is powered by Android KitKat 4.2.2, a 2.5Ghz quad core processor with 2GB of memory, fast 802.11 a/c Wi-Fi with 2×2 MiMo antennas, Cat 4 LTE, and offers 20% better battery life compared to the Galaxy S4 using a user removable 2,800mAh battery. Other improvements include what Samsung is calling the world's fastest auto-focusing smartphone camera: a 16-megapixel rear-facing camera that can focus in just 0.3 seconds with real-time HDR, 4K video recording like the Note 3, and background blurring action thanks to a new Selective Focus feature. The Galaxy S5 combines an advanced camera, the fast network connectivity, dedicated fitness tools and enhanced device protection features as consumers stay fit and connected in style. Other notable new features include a fingerprint scanning home button that works by swiping down on it to unlock the device. Users will also be able to use the Galaxy S5's fingerprint sensor to authenticates purchases including PayPal transactions without having to physically input their password. There's also an improved LED flash with a heart rate monitoring sensor built-in right next to it. The two will work in tandem to measure your finger pulse. As for the GS5's speaker, well it was left behind. More after the break including a video demonstration of how the Galaxy S5's new fingerprint scanning home button works in practice. 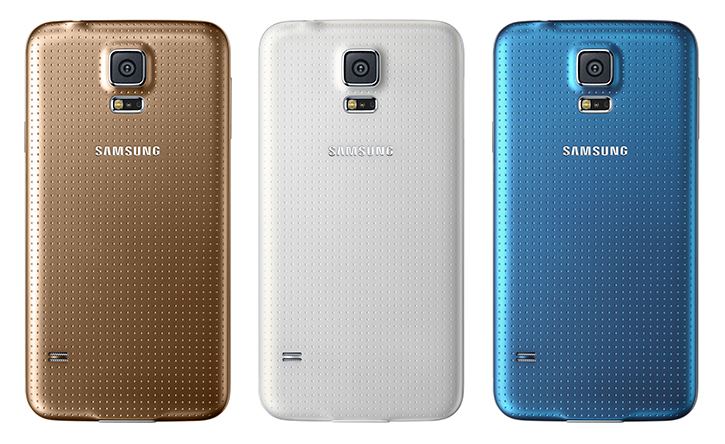 The Galaxy S5's new sleek, contoured shape comes in an array of vivid colors, including charcoal Black, shimmery White, electric Blue and copper Gold, to complement the style of the individual consumer. 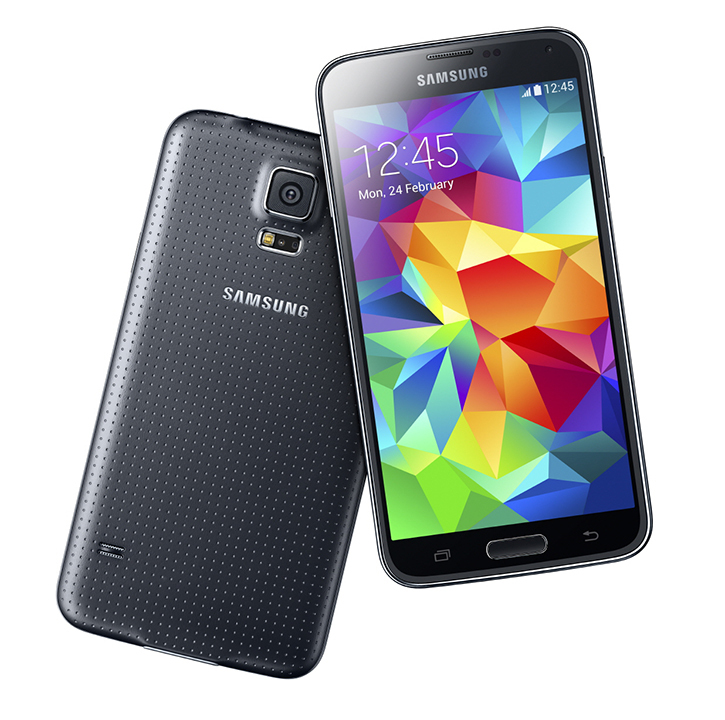 The Galaxy S5 will come in two capacities: 16GB and 32GB with a the ability to expand the internal storage using a microSD card. Samsung is yet to announce pricing, but the company has confirmed that its new flagship smartphone will be available on April 11. And if you're heart is set on Samsung's glam new handset, you may want to know that case manufactures like Spigen are already offering cases to protect the Galaxy S5 and are expected to ship on April 15.